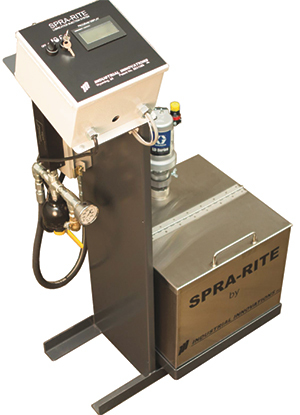 Industrial Innovations, Wyoming, MI, will demonstrate its airless Spra-Rite high-pressure pedestal spray-lubrication system, designed to atomize thick, emulsified lubricants of a rich dilution—often required when forming high-strength steels and other challenging materials. The pedestal style allows easy transport of the equipment from press to press. The system can generate pressures to 500 psi, and then distribute the pre-mixed lubricant from the 20-gal. reservoir tank and propel it through a filter and then through a patented Z-nozzle. The lubricant is then atomized and applied to specific areas of the stamping or draw tooling and/or the stock. Outfit the lubrication system with as many as 24 spray nozzles, each independently controlled and electrically operated for precise application of highly viscous lubricant. The controls package offers 200-part recipe storage and individual control of cycle, delay spray and volume. Additionally, the microprocessor-controlled injector valves eliminate the need for poppets, o-rings or check valves. See also: Industrial Innovations, Inc.